SugarCRM is a popular CRM choice for businesses looking for a cost-effective solution with name recognition. As one of the leaders in open-source software, SugarCRM gained a lot of popularity in the mid 2000’s, but development on it’s free community edition has been discontinued and their focus has been placed on their paid professional, enterprise and ultimate editions which are still limited compared to other solutions on the market. SugarCRM has the basic feature set you would find in most CRM solutions, which paves the way for alternatives to SugarCRM that are both more cost-effective and feature-rich. What you’ll find in Sugar are standard lead and contact management, sales forecasting, marketing and campaign management, as well as various reports and dashboards. What Makes for a Good Alternative to SugarCRM? While SugarCRM has the common features you would find in most CRMs, their marketing and campaign management are lacking. And if you’re planning on sending out email campaigns through the SugarCRM, then you better watch out because the system will drag or even crash! One of the most common complaints about SugarCRM is the speed, and anyone who’s used it can attest to that. You can even view a speed comparison of SugarCRM vs 1CRM here. Besides speed, another reason why businesses look at alternatives to SugarCRM are the costs. Sugar became popular though their open source product, but when people realize the added costs it takes to customize and set up the product they often run away. And when reviewing the paid options it’s clear that there are better alternatives on the market. You can view more alternatives in our previous post “Alternatives to Salesforce“. Why do other businesses look at alternatives to SugarCRM? Functionality. As a growing business one of your main concerns is keeping your technology costs low by eliminating the need for multiple systems and development/customization. Using SugarCRM means you’ll still need to implement more systems for project management, billing, and order management, while also customizing the platform to meet your needs or integrating 3rd party tools. 1CRM is the best alternative to Sugar. The table below shows how 1CRM beats SugarCRM feature-to-feature. 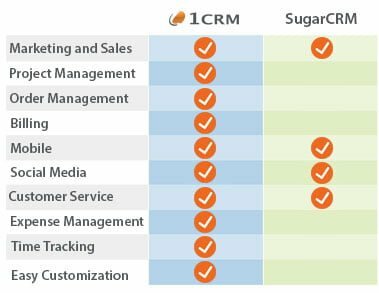 Unlike Sugar, 1CRM isn’t limited in scope and aims to help streamline your entire business by including project management and order management as well, while also integrating with all the 3rd party platforms you care about. 1CRM has been built with small and mid-sized businesses in mind and provides a more cost-effective solution when you’re growing from 10 to 25, 50, or even 100+ users while never sacrificing functionality. If you don’t believe how much better 1CRM is than Sugar, then see for yourself. Sign Up for A Free 30-day trial of 1CRM today!